Because that’s what I do 230 times a year. But I want to do better for you! September is a goooooorgeous time of year to visit the 612/651. You can frequently find incredibly cheap flight to the Twin Cities from Denver or Chicago and bus tickets for less than $20. We’ve got an Amtrak station so you can even train it! 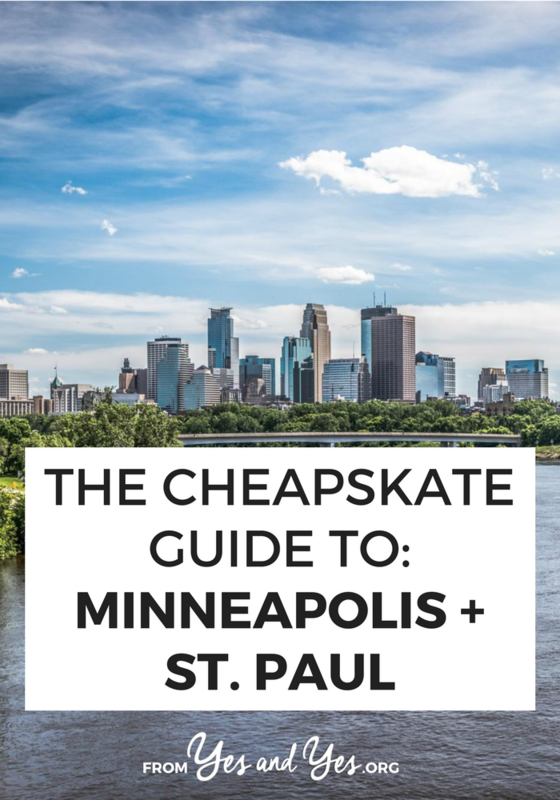 Because I wanted to keep this travel guide crazy affordable, I tried to assemble an itinerary that would allow you to stay and play in MSP for around $60 a day – lodging included. If you’ve got a bigger budget, feel free to ignore my camping suggestions and save money by eating at a cheap, amazing deli or checking out a $3 matinee. Yes, really. You can pitch a tent 15 miles east of Minneapolis in one of Afton State Park’s 28 campsites or in Three Rivers Park in Plymouth. If you’re traveling with friends who aren’t afraid of roughing it a tiny little bit, you mustmustmust rent a yurt or a camper cabin. You can rent a three-person yurt for $55 or a four-person, architect-designed camper cabin for $68. Camper cabins are super popular so make reservations well in advance. There’s a surprising number of super affordable rooms on good ol’ Airbnb. There’s a well-reviewed tiny house (re: shed) with a lofted bed, a nice big bedroom out in the suburbs for $30 a night and a super cute $45 room in quiet, cool NE Minneapolis. If you’ve never used Airbnb before, here’s a $40 credit towards your first booking! Oh, what’s that? A world-class museum for zero actual dollars? With pieces from Monet and Matisse and 40,000-year-old artifacts? Dontmindifido! Special exhibits cost extra, but the main galleries are always free. The Como Park Conservatory will absolutely bowl you over with its Great Gatsby-ness – you just know Daisy is about to flounce out those doors, spilling a martini all over her dress. Have a peek through the hot house flowers and see if you can find Chloe The Sloth. If you’re there on Saturday or Sunday, take a spin around the gorgeously restored carousel! The Guthrie itself is a gorgeous, decidedly not-cheap, nationally-renowned theater. But! You can walk in the door and take one very long escalator ride up to the ‘Endless Bridge,’ The Guthrie’s cantilevered lobby that stretches more than half a block from the building face. Buy an overpriced drink and appreciate the view! * slight exaggeration. In fact, there are 20 lakes within Minneapolis’s city limits and you can bike, rollerblade, walk or run around most of them. Lake Calhoun is Minneapolis’s busiest lake and is frequented by tons of athletes, cute dogs, and surrounded by drool-worthy mansions. And if you go, you’ll probably see me because I am there every time the movies switch out. For $3 you can see second-run movies on a huge screen, in comfortable stadium seating. The lobby has been beautifully restored to its gold-veined-mirror mid-century glory AND THEY — USE REAL BUTTER ON THE POPCORN. Really and truly a must-go. Conveniently, these inner-city waterfalls are just a mile and a half from The Riverview and – NBD – they inspired Longfellow’s Song of Hiawatha. Rule breakers constantly jump the fence and tromp around behind the waterfall; do with that information what you will. If your don’t want to risk you neck on slippery rocks on a cliff face, you can stare at the waterfall while eating a $5 fried fish sandwich from Sea Salt. Did you know that Minneapolis is the only U.S. city on a worldwide index of bike-friendly cities? Use our Nice Ride bike sharing system and take advantage of our bike lanes, bike-friendly public transport and 5.5 mile Greenway! There are Nice Ride stations all over the metro area and it only costs three dollars for an hour and a half if you’re a member! Take a million photos. Nurse a coffee. Feel the wind in your hair. Admire all the cute dogs. Check out the food trucks that are frequently parked nearby. An amazing, award-winning Vietnamese noodle house deep in the heart of St. Paul’s Frogtown. I go here so often, the manager cheered when I told him I got married. 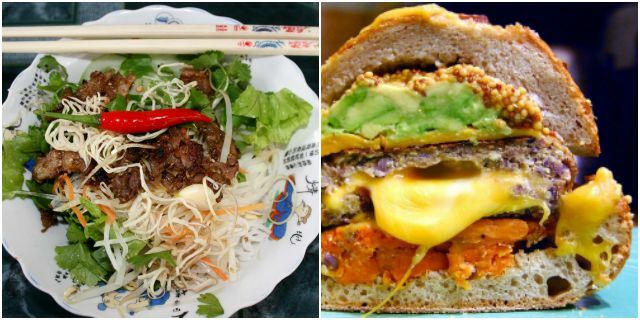 I swear by the bun chay or the spicy lemongrass mock duck. Like any self-respecting hole-in-the-wall, it’s cash-only and it’s right on the green line if you’d like to explore our fair cities via lightrail. The Blue Door is one of several bars that claim they invented The Juicy Lucy – Minnesota’s famous cheese-filled hamburger. I don’t know who invented it, but I don’t care because The Blue Door has a build-your-own grilled cheese option. I’d suggest going early, late, or calling an order in because they don’t take reservations and a 45-minute wait is not uncommon. A stronghold for crust punks, students, and socialists, this place has amazing vegan food for a pittance. I’ve eaten hashbrowns in 20 different diners around Minnesota and theirs are, hands down, the best. Of course, they don’t even have a website so I can’t tell you their prices but they’re incredibly low. I bet you didn’t expect a vegetarian to be recommending a hotdog/bratwurst/sausage joint, did you? Luckily, they have lots of vegetarian and vegan options! 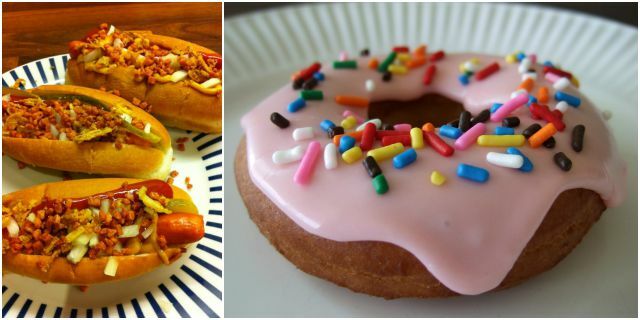 You can dress up your dog with fried onions, green peppers, mayonnaise, the kitchen sink! Of course, they also serve hand-cut fries and root beer floats. Granny Donut is technically located in West St. Paul BUT IT IS WORTH THE DRIVE DON’T QUESTION ME. Operated by the same family for 20+ years, open 365 days a week, serving fresh-made donuts for 80 ever-loving cents, this gem is located in a strip mall like all good bakeries should be. I love their cherry glazed cake donuts and allegedly their apple fritters are so good people FedEx them to friends out of state. Whew! I’m sure there are tons more fun, cheap, amazing things to do in the Twin Cities that I’ve missed. Fellow Minnesotans, add your suggestions in the comments! I’m glad you got some of my favorites, but I’m going to have to get myself to Granny Donut to see how it compares to the Aitkin Bakery! I have never even considered Minneapolis/St. Paul as a vacation spot but now I am really considering it! My husband and I have been trying to figure out somewhere to visit for our 5 year anniversary in May and Minneapolis might be a perfect place! It really is lovely! St. Paul was voted the most romantic city in North America last year! I’m obsessed with the fact that Trieu Chau is at the top of the list. It’s like the equivalent of Sunday supper in my family. YESSSSSS. Clearly we need to meet there for lunch, yes? Dang. I’m just back (in NZ) from 2 weeks roadtripping around the Pacific North West. Now I want to pack up again and head your way. Oh America why you so far away and so enormous that I can’t see you all at once! I know! I live in America and I’m regularly floored by how huge it is! Must Minnesota is six hours from corner to corner! Such great timing with the MSP guide! I just moved to St. Paul last week and will use this list to get to know my new city. Jill, you’re going to looove St. Paul! I lived in Cathedral Hill for five years and loved every minute of it. Really, check out the Frogtown Salvation Army and the Sun Foods grocery store next to it. The neighborhood leaves something to be desired but that Salvation Army is the least picked-over that I know and Sun Foods has red peppers for $2 A POUND! To add to the list, I love Isles Bun and Coffee. Their cinnamon rolls are so inexpensive and perfect for sharing. Also, it’s not tremendously inexpensive on the surface, but the bar at the top of the Foshay tower has happy hour. The cocktails are $7 which is a bit spendy, but you get to sit in a super fancy historical spot with beautiful views. For me, it’s a way to have a fancy moment while also not spending a ton of money. Oh, I’ll have to check out Isles Bun & Coffee! I’m on a hunt for The Best Cinnamon Roll in MSP and I haven’t tried theirs yet! Trieu Chau isn’t cash-only!! We’ve used a card the last few times. Will have to try your suggestions and break out of the pho habit. Nice to have some information about travelling. This is really great — my husband and I are moving to MSP this summer, and this definitely makes me feel more comfortable with getting to know the city (and knowing what to look at and where to stay when we go up in a month or two to find a place to live). If only we knew where within the cities we should live. Bringing my daughter to see her Vikings at their new stadium and sounds like a train trip from Los Angeles may be nice or a quick flight. Thanks for this guide and looking forward to our trip to Minnesota and as my daughter “Skol Vikings”!!!!! !